Finally, we approach the New England region and family time. 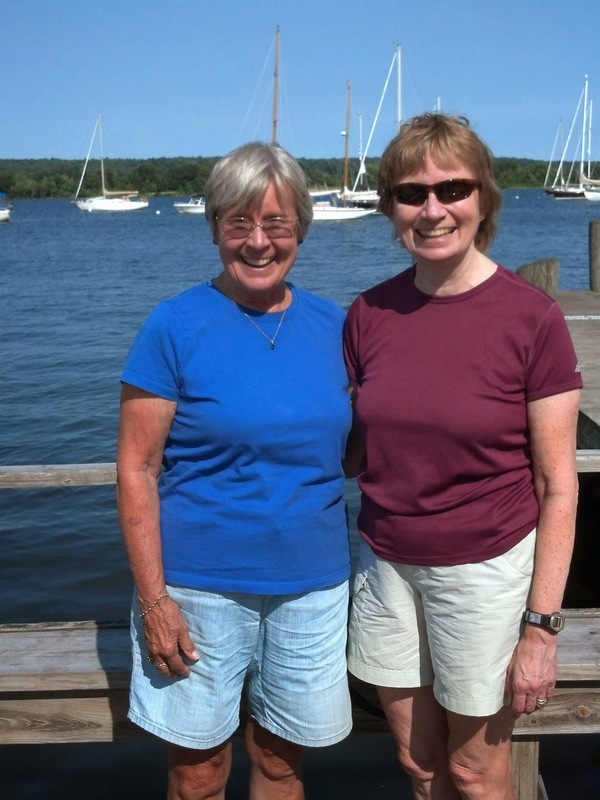 Our first stop is Connecticut and a nice visit with Jan's sister, Marsha. 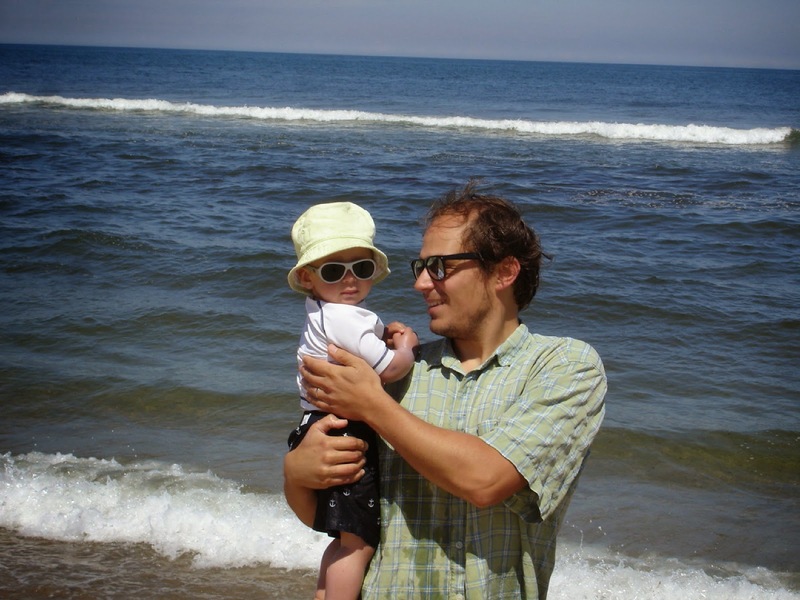 It is our first time at Hammonasset State Park . 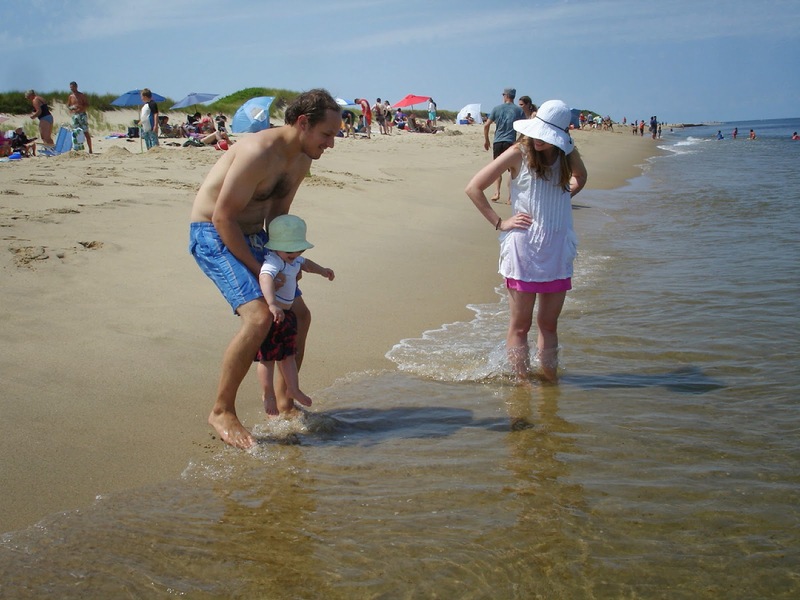 It is a large 550 site state park with great access to beaches(walking from your site) on Long Island Sound. Marsha and Mark gave us a nice tour of local towns like Essex https://images.search.yahoo.com/search/images;_ylt=A0LEV03qgu9TuAkAcyVXNyoA;_ylu=X3oDMTB0bmtlYmsyBHNlYwNzYwRjb2xvA2JmMQR2dGlkA1ZJUDQ0Ml8x?_adv_prop=image&fr=ff-hp-s&va=essex+ct and Old Saybrook https://images.search.yahoo.com/search/images;_ylt=AwrB8o77gu9THTEAkMCJzbkF;_ylu=X3oDMTBsZ29xY3ZzBHNlYwNzZWFyY2gEc2xrA2J1dHRvbg--;_ylc=X1MDOTYwNjI4NTcEX3IDMgRiY2sDNWFob21qOTlwbXZrZSUyNmIlM0Q0JTI2ZCUzRFkyZjRWWnhwWUVMRVJVX0J5S1BLNXhTR2lMWXo4RExKSE44OEdBLS0lMjZzJTNEcmMlMjZpJTNEb2lmTERsNDlJOHhtbXJXa2w3ZVAEZnIDZmYtaHAtcwRncHJpZAN0WkdZVExuQlNSNjFQLmsyNXhlanFBBG10ZXN0aWQDbnVsbARuX3N1Z2cDMTAEb3JpZ2luA2ltYWdlcy5zZWFyY2gueWFob28uY29tBHBvcwMxBHBxc3RyA29sZCBzYXlicm9vawRwcXN0cmwDMTIEcXN0cmwDMTIEcXVlcnkDb2xkIHNheWJyb29rBHRfc3RtcAMxNDA4MjA1NzEwNTcyBHZ0ZXN0aWQDSTIwOA--?gprid=tZGYTLnBSR61P.k25xejqA&pvid=VyyV6TY5LjFVRxaaU5t.jg5KMTc0LgAAAABoX_eh&p=old+saybrook&fr=ff-hp-s&fr2=sa-gp&ei=UTF-8&n=60&x=wrt, and , of course, local seafood spots. These are very long links, but they came up on Yahoo with some nice pictures of the two towns. Thanks Mark and Marsha! 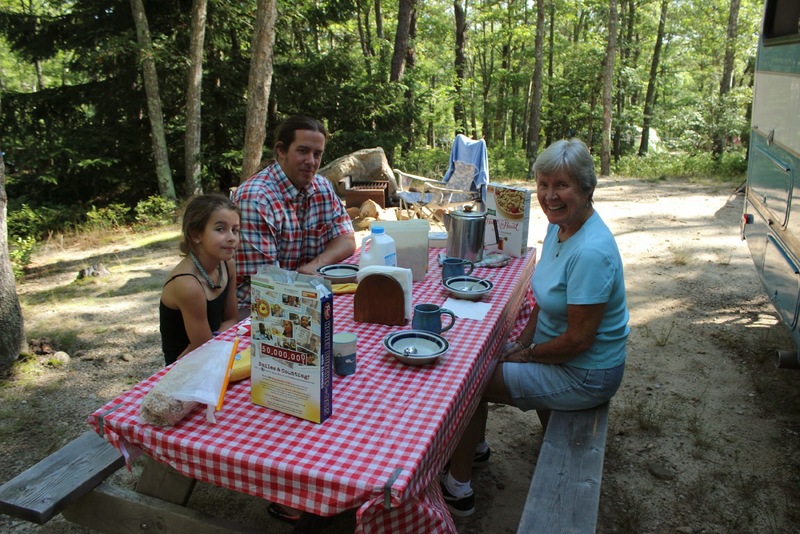 A great visit with friends Nancy and Dave and then off to Sandwich, Cape Cod to link up with Sean and Madison. This stop was at Shawme-Crowell State Park. 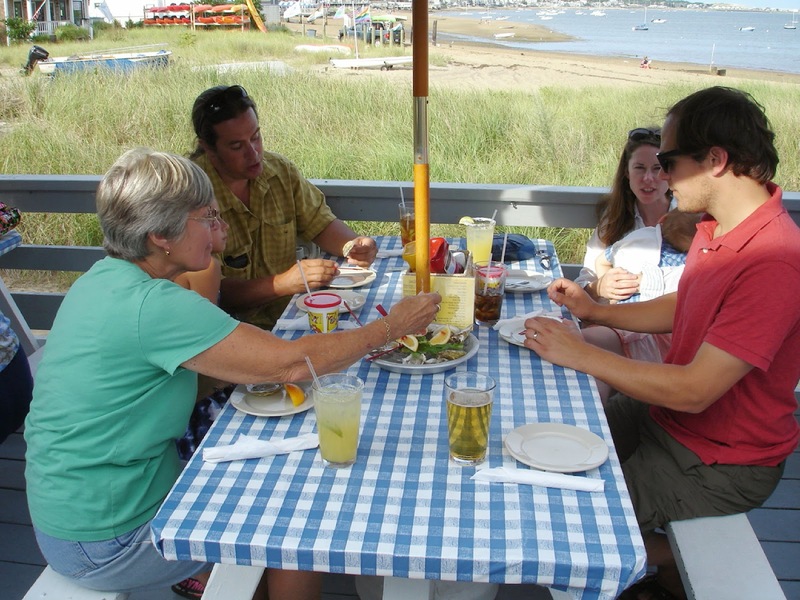 For us, it is a nice way to be on Cape Cod before the weekend starts and avoid much of the Saturday traffic. We had also had a great visit with Gary and also a wonderful visit with Scott, Rachel, and Lucas before heading for the Cape. 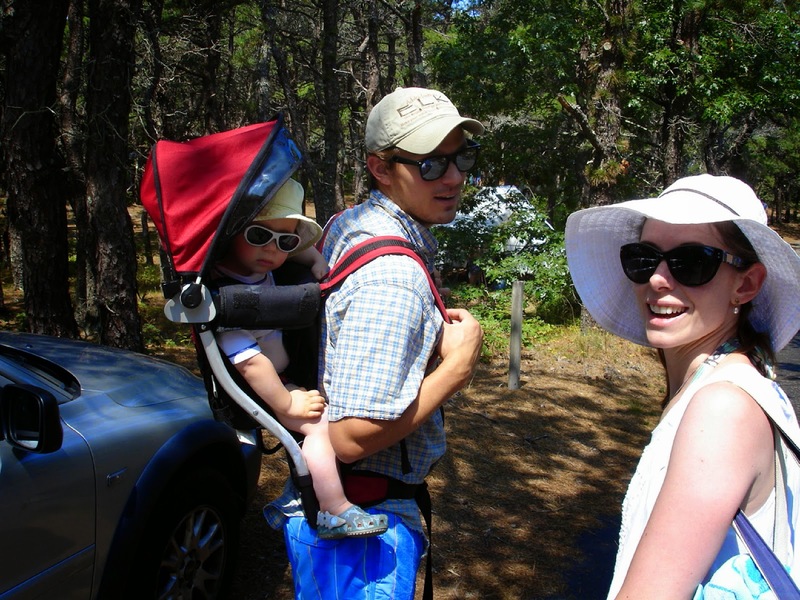 Here we are, in North of Highland Camping Area in North Truro, Massachusetts. Our favorite camping area for 45 years. Nice to see that the third generation is enjoying it as well! 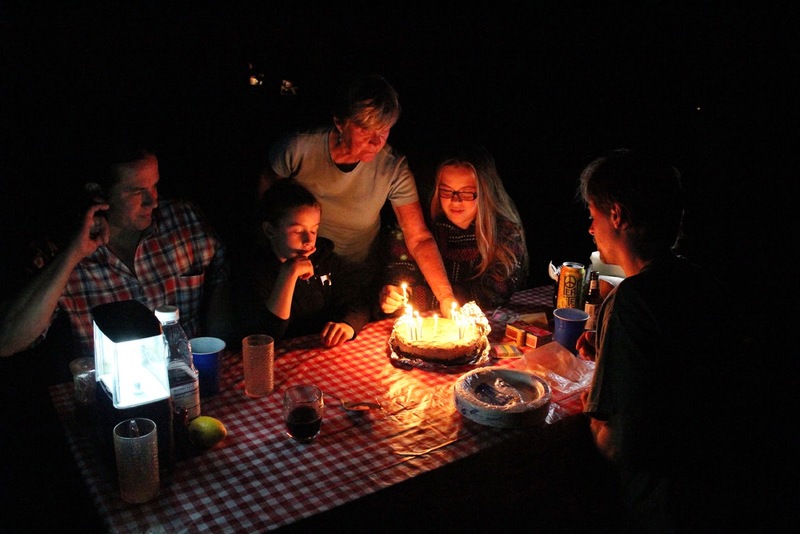 It is long overdue for birthdays, but we try to catch up when and where we can. In this case , it is a chance for celebrating Emilie and Madison's birthdays from July and August. And one of them just turned 16! 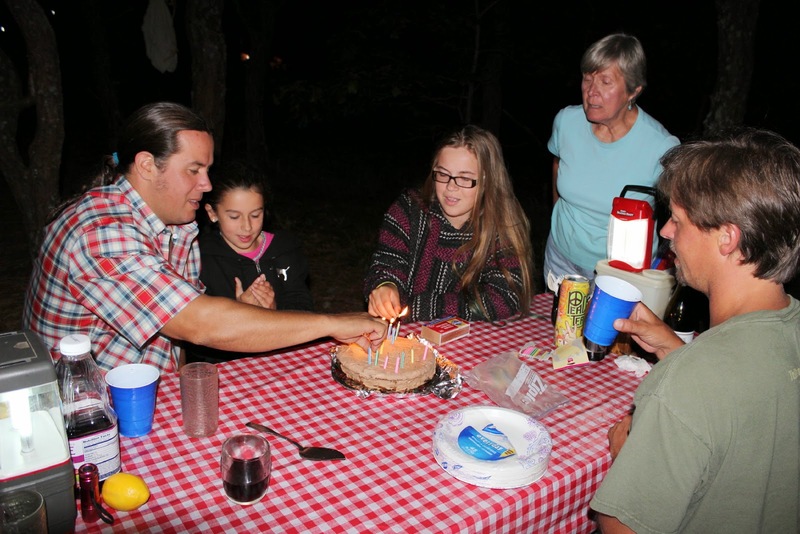 Even extra special when you celebrate at night in your campsite at the picnic table. By the way, Jan loves using the oven in Lady Blue. This was her special Hot Milk Sponge Cake with Mocha Frosting. Wow! 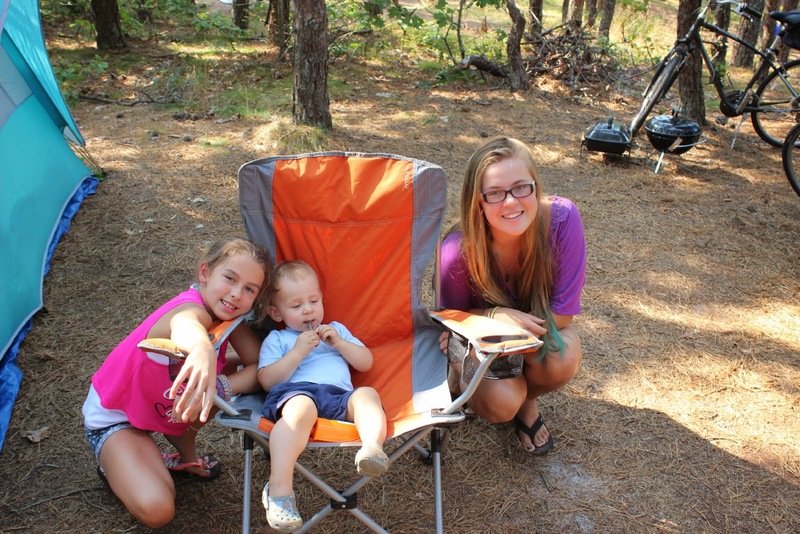 All three grandchildren together. Emilie and Madison look happy and Lucas was extra happy to discover cousins!!!! Actually, he had met them before, but now he recognizes them and can say their names. Emilie and Madison are quite happy to see other. 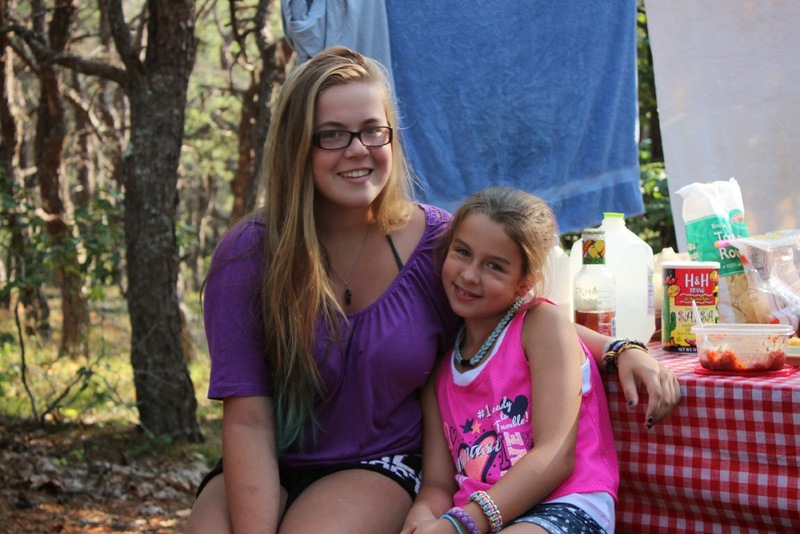 They both have memories now of the beaches and camping on Cape Cod. The visits for all go by way too quickly. Work schedules and vacation time mean a short visit for some. We all were missing Alison and Keith on this visit, but we will catch up with them on Labor Day weekend. Yea! 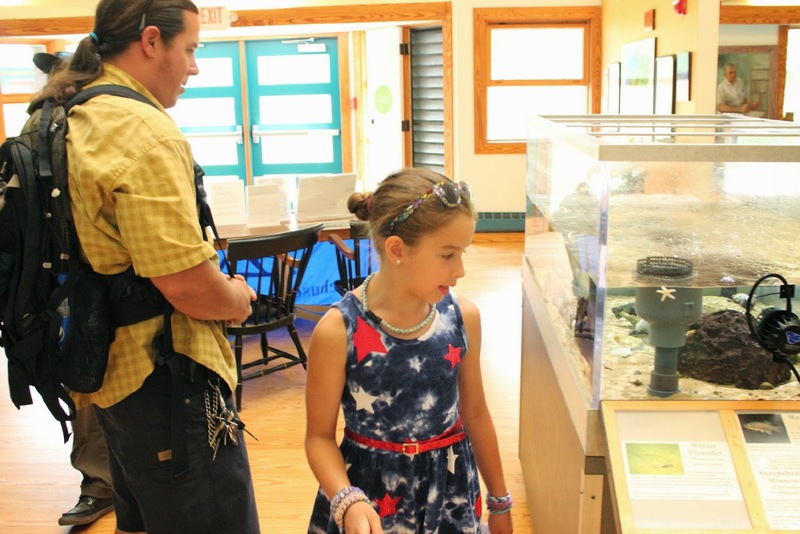 A great place to visit on the Cape is the Wellfleet Audubon. Lucas and Madison enjoy the displays in the relatively new center. Gail and Richard must remember that they introduced us to this wonderful place! Grandpa Bruce is still getting used to his new camera. Unfortunately, this picture was supposed to be a lot darker. 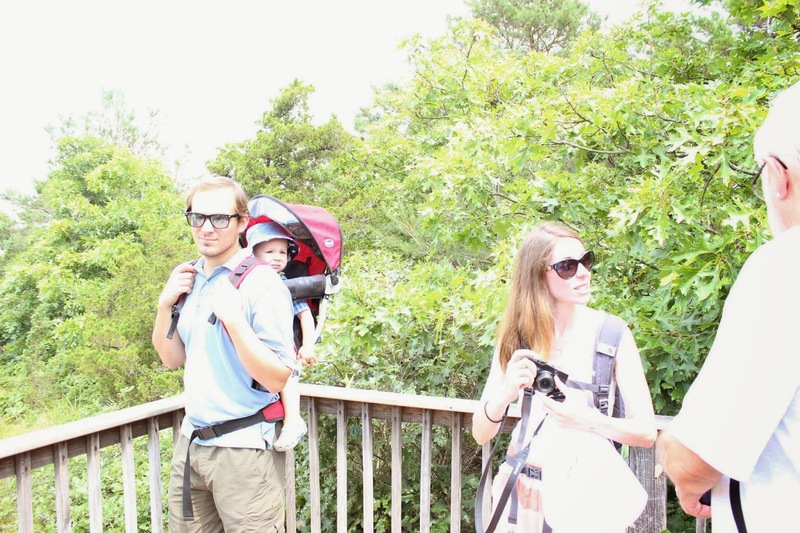 But still a nice picture of Scott, Rachel, and Lucas at a bayside overlook. 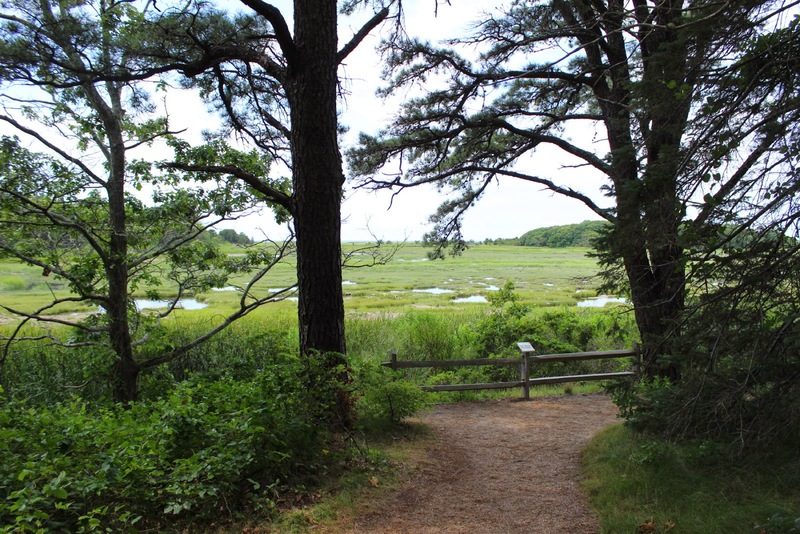 The Audubon has some great views of Cape Cod Bay and great trails. Lots and lots of Bayberry. 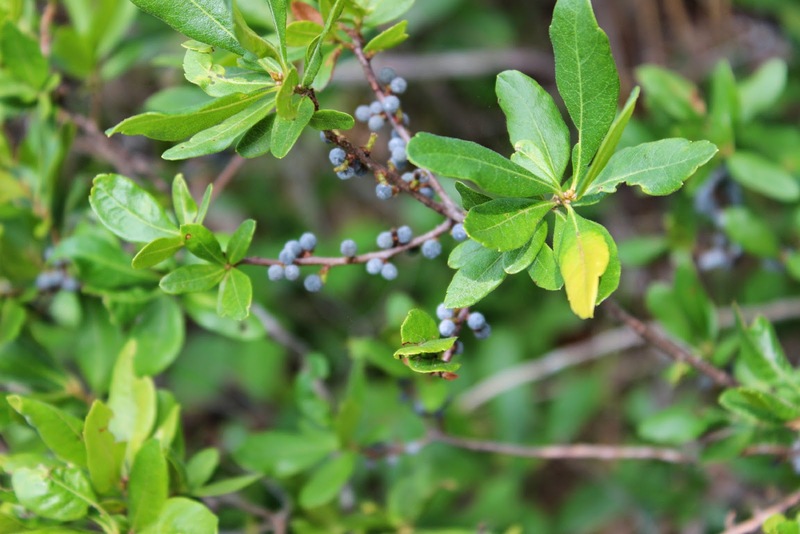 Not quite ripe yet, but a scratch of the berries gives you that great bayberry scent. Ah yes, the next fashion model???? 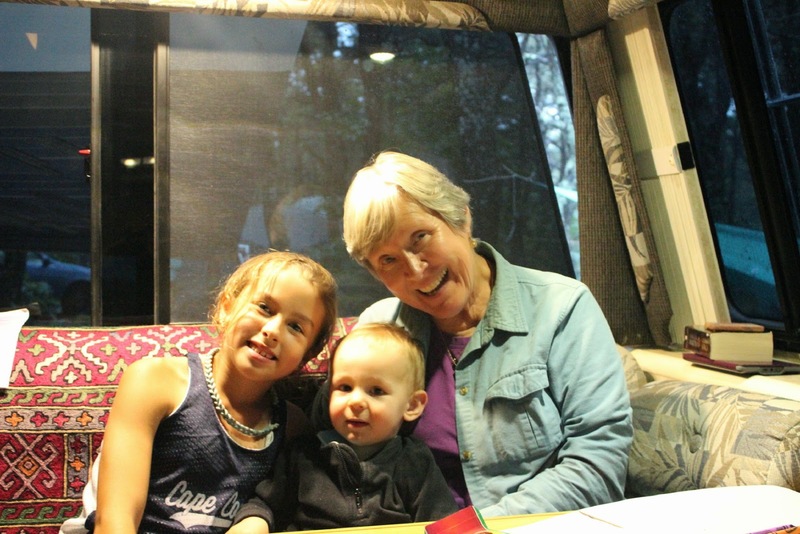 Inside Lady Blue is always a great spot for Grandma to visit with Grandkids. 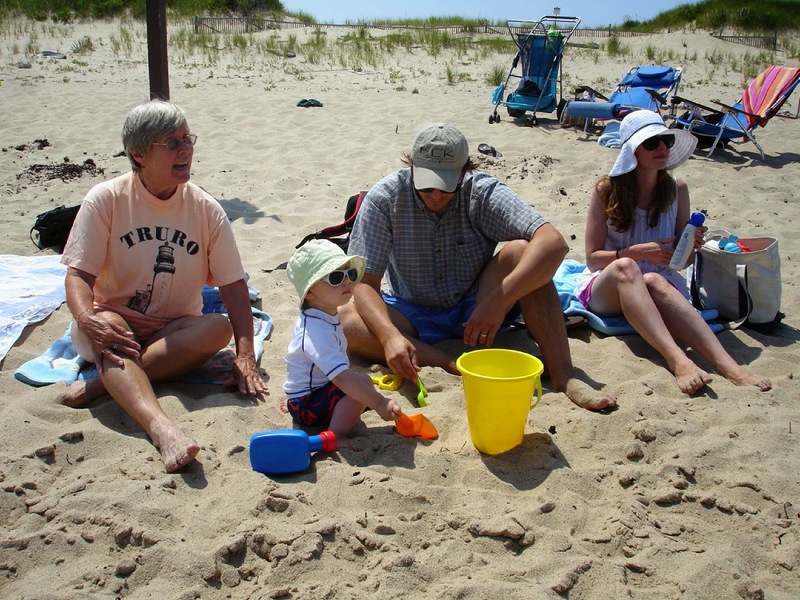 Of course, probably the biggest attraction of camping on the Cape is a visit to the beach. Are you ready Lucas!!!! How can he miss with those shades. Oh yeah Dude, those shades are working!! The boy and his sandpail, scoop,rake, and shovel. Don't you wish you could go back to those simple pleasures? Actually, Lucas had no problem with the ocean water. Scott and Rachel had to keep a check on him or he was ready to bound right in---no fear and not too concerned about the cold water. So, Madison. tell me about this beach. What's the scoop. Tell me all about it. 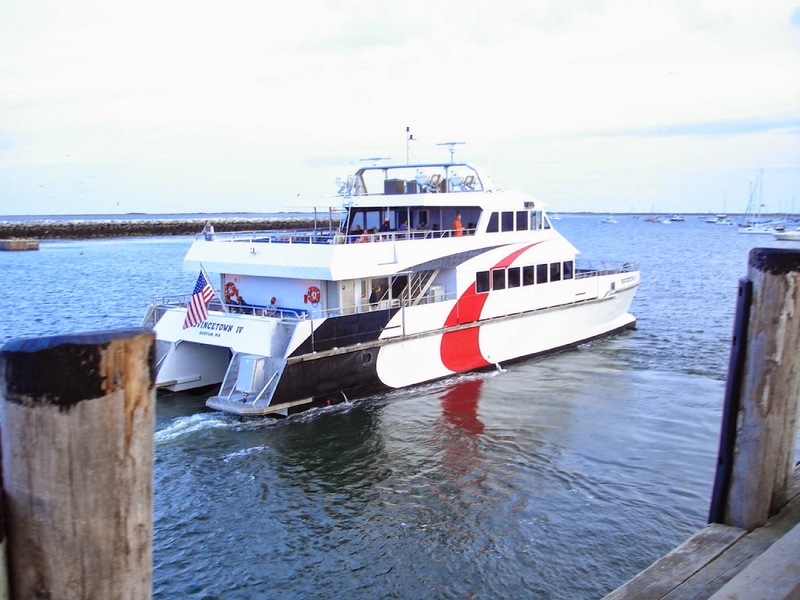 Usually, a visit means a trip into Provincetown. 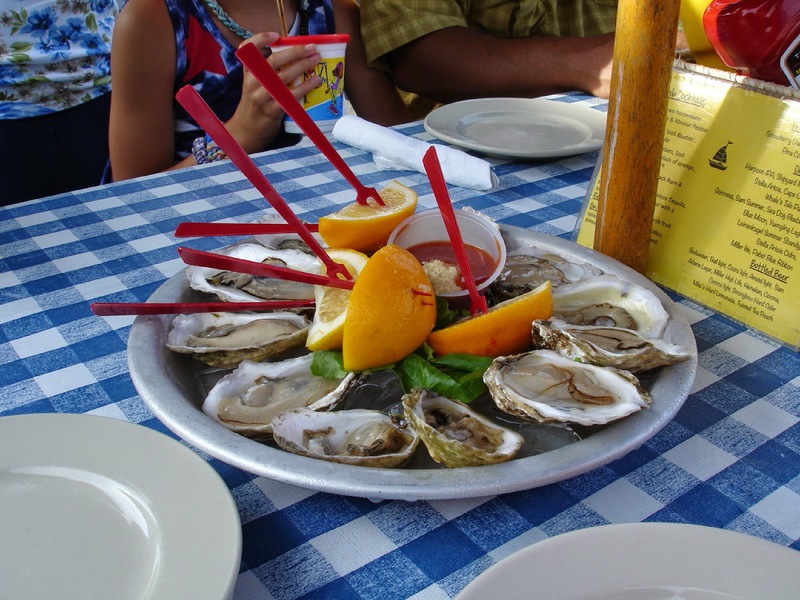 It doesn't hurt to add a nice seafood dinner by the side of the harbor. These are wonderful Wellfleet oysters. A great dinner. And yes, Madison and Lucas are there at the table. All too soon, Rachel has to be off on the Fast Ferry to Boston. 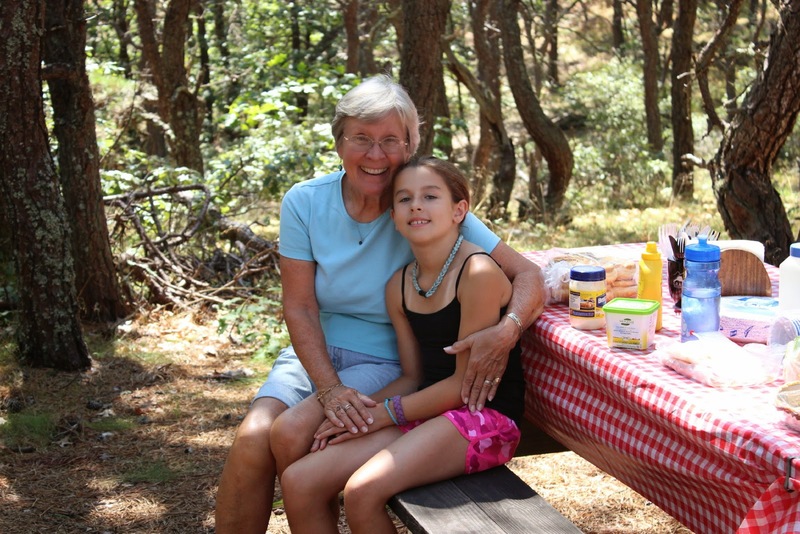 Work calls and we are sad to see her go, but we are glad that she had some time to spend at the Cape. Bicycles have always been a part of the Cape Cod vacations. 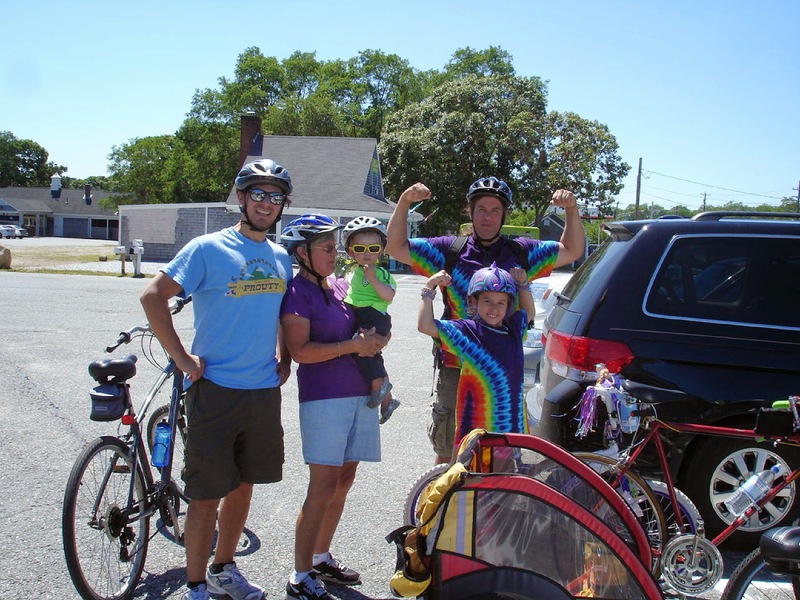 There are wonderful bike routes, bike paths, and the Cape Cod Rail Trail that offer plenty of opportunities. Madison is ready for her second year at 10 years old. 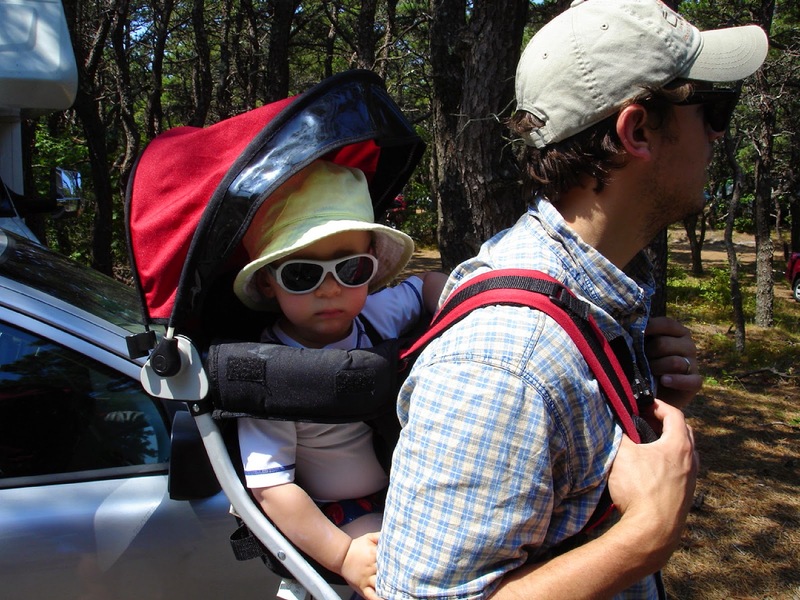 And this time, Lucas is going to try his first venture in a bike trailer. Love the helmets folks. Safety first! You knew this was coming, didn't you? Even on our bike rides, we always try to find a place to eat. 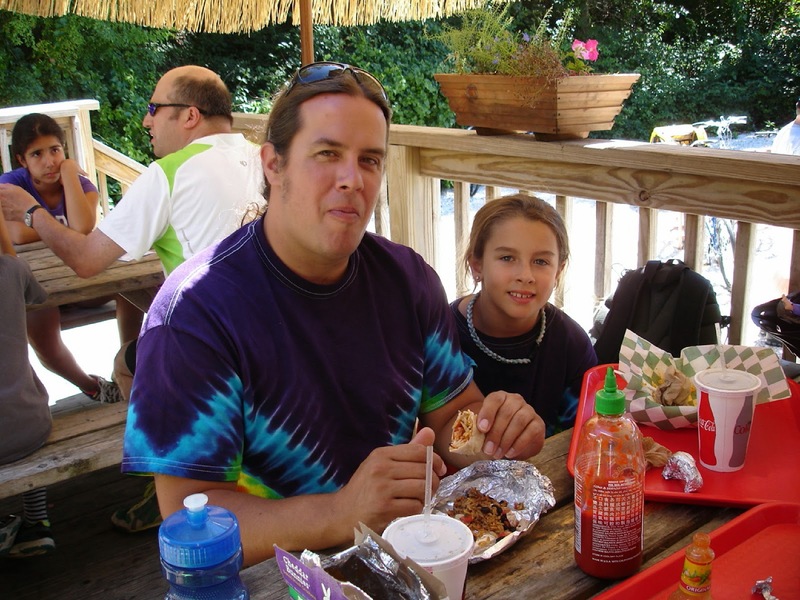 In this case it is Guapos in Brewster on the Rail Trail. Madison lead our charge down the Cape Cod Rail Trail. She went over 32 miles this day. We were happy to complete 26 miles. Grandpa remembers when he used to ride his age in miles every year. Now that seems like a bit of a stretch!! Well, we know Lucas has had a great beach visit. What's that? You bet! Can't wait till next year! Madison agrees. She and Uncle Scott, and her Dad spent some great time jumping and riding the waves. 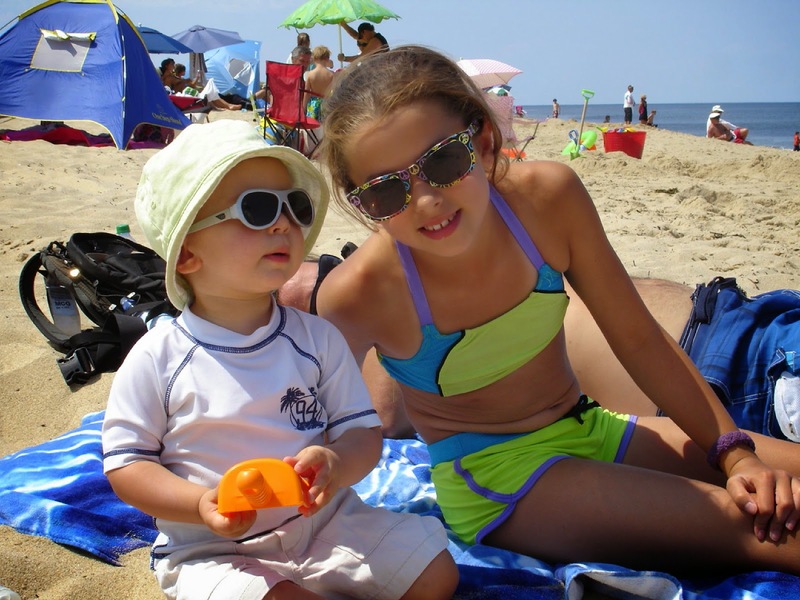 Gary and Emilie enjoyed some great beach time as well --hopefully more for them next year!